There are a variety of algorithms you can use to determine relative sample thickness. However, the log-ratio (relative) method is most commonly used. 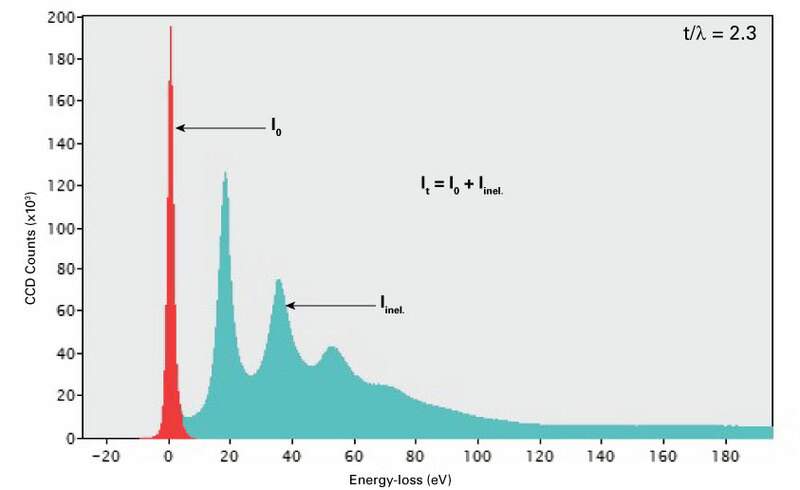 Following Poisson statistics, the ratio of zero-loss electrons to the total transmitted intensity gives a relative measure of the specimen thickness in units of the local inelastic mean free path λ. \(t/\lambda\) is the mean number of scattering events per incident electron. You can compute this easily from low-loss spectrum via the Thickness button located in the EELS Processing palette in the Techniques panel. When you perform this analysis, you can determine if the region is thin enough for EELS and if plural scattering has significant impact.